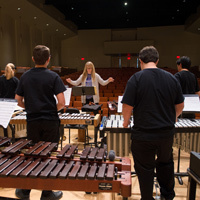 The Community Music School of Webster University (CMS) has offered outstanding music education and performance opportunities to students of all ages and abilities in the St. Louis area and beyond since its founding in 1925. The National Endowment of the Arts (NEA) has awarded a $15,000 grant to the Community Music School of Webster University (CMS) in support of its Preparatory Program for outstanding young music students. Grant funds will help cover the costs of Prep activities in 2017 including coaching, master classes and events that showcase the skills of our young chamber music performers. "It is with tremendous gratitude that the Preparatory Program receives this NEA Award," said Vera Parkin, artistic director of the Prep Program. "The continued support of our nation's highest granting institution confirms the talent and merit of our St. Louis region's best students, and the commitment of our entire musical an community to creating a youth arts culture that rivals that of anywhere in the United States. "The NEA Award is much more far reaching than simply funding a musical activities. It is developing a citizenship for this country's future that is ready and able to serve, participate, and go the distance." All local CMS performances are open to the public and are free of charge.